CARFAX One-Owner. Clean CARFAX. Certified. Magnetic Gray Metallic 2015 Toyota Avalon XLE FWD 6-Speed Automatic ECT-i 3.5L V6 DOHC Dual VVT-i 24V21/31 City/Highway MPGToyota Certified Used Vehicles Details: * Powertrain Limited Warranty: 84 Month/100,000 Mile (whichever comes first) from original in-service date * Warranty Deductible: $50 * Transferable Warranty * 160 Point Inspection * Roadside Assistance * Limited Comprehensive Warranty: 12 Month/12,000 Mile (whichever comes first) from certified purchase date. Roadside Assistance for 1 Year * Vehicle HistoryWHY CHOOSE HAMER TOYOTA? SIMPLE - we choose volume sales over large profit margins! Serving the good folks of the San Fernando Valley from the same corner since 1939, we are in the TOP 10 IN THE USA on Certified Pre-Owned Toyotas and every pre-owned vehicle passes inspection or we don't sell it!! Our Service Department is filled with Toyota Master Technicians who care, our Parts Department is fully stocked, we offer a free shuttle during your service, and provide free wifi in our Customer Business Center. 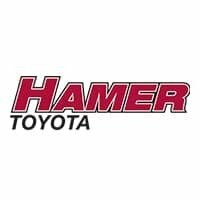 Buy from Hamer and receive a 15% Off Parts Card good for life! At Hamer Toyota, WE HEAR YOU!